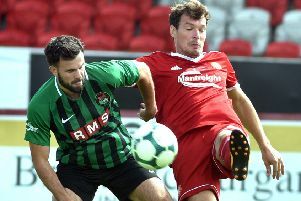 Cliftonville got back to winning ways as they beat Coleraine 1-0 at Solitude. Daniel Hughes’s second half goal gave the Reds the three points in a game which took a while to get going. The visitors started well dominating the early possession without causing the Reds any real problems at the back. In fact it was the home side who carved out the first real goal scoring opportunity with 19 minutes gone as Jay Donnelly picked out Jude Winchester in space, but he dragged his shot across the face of goal. The Bannsiders should have broken the deadlock two minutes later as a mix up between Jaimie McGovern and keeper Jason Mooney saw Chris Johns’s long free kick beat them both, however James McLaughlin snatched at the loose ball and fired over the empty net. Unfortunately the rest of the first half was largely a non-event with neither side really forcing the issue. Coleraine almost edged in front before the hour mark after a poor clearance from McGovern teed up Jamie McGonigle, his first time shot though cannoned off the post with Mooney beaten. It was the home side who grabbed the opener on 63 minutes as a long ball wasn’t dealt with in the Coleraine box and Daniel Hughes reacted first to squeeze the ball home. The goal injected some confidence into Cliftonville and they almost doubled their advantage on 72 minutes. Martin Donnelly weaved his way into the box before picking out Chris Curran, his first time shot was straight down the throat of Johns though. At the other end Mooney reacted well to save Gary Twigg’s corss after it took a deflection off McGovern. And the big stopper held on to McLaughlin’s powerful header on 77 minutes. The striker almost caught Mooney out with a long-range effort on 81 minutes after good work by Kee, however, the keeper got back sharply to save. Cliftonville: Mooney, McGovern, Ives, McGuinness, Knowles, J Donnelly (Curran 64), Hughes, Harkin, Winchester (Catney 81), M Donnelly (McDaid 83), Cosgrove. Coleraine: Johns, Kane, Brown, Douglas, Ogilby (Morrow 85), McCafferty, Kee, Parkhill (Allan 74), McGonigle (Twigg 65), McCauley, McLaughlin.